In 1942 he was called up and by April 1943 found himself in North Africa as a Wireless Operator reinforcement to the 1st Army. Ron’s unit, the 49th Light Anti-Aircraft Regiment, R.A. was involved in the whole of the Sicilian campaign before moving on to the Italian mainland. His Regiment was disbanded in late 1944 and he was retrained as a Wireless op in tanks. Ron’s unit, the 49th Light Anti-Aircraft Regiment, R.A. was involved in the whole of the Sicilian campaign before moving on to Italy where he remained until early 1947. 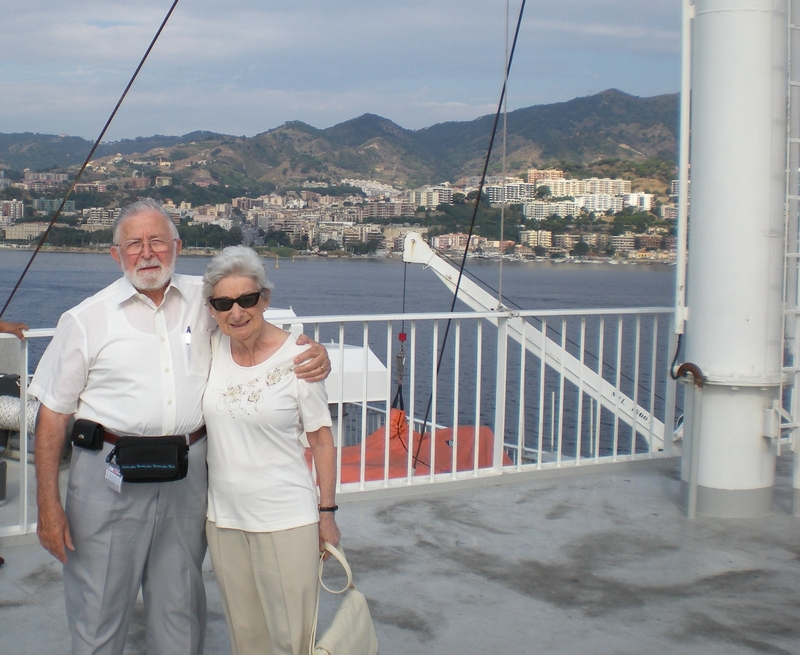 In September 1943, Ron crossed the Messina straits in a Tank Landing Craft. It was this memory that stayed with Ron and despite visiting Italy many times after the war, he had never returned to Sicily. Ron felt that to make this journey once again would lay matters to rest. My father, Ian Jones, was also an operator/signaller serving for the British Army in WWII. Dad is 87 now, and doesn’t speak too much about his WWII experiences, although he does tell some stories when asked. The ones that stand out are about his young friends that lost their lives fighting. One is buried in Cassino, Italy, and I would love to give my dad a chance to return to this site and possibly also North Africa, where he spent many lonely weeks not knowing where they would be next, or if they would make it home again. Finding this story is inspiring me to pursue more information, and hopefully allow my dad to return to some of these sites while he still can.